Starting off as Product Manager as the new kid in a new gig. I’m new to SEEK but I am in my sixth or seventh new product context, most recently coming from a start-up. It gets easier each time to start out in a new environment but there is always a learning curve. Part of that is understanding how work gets done in the new place. It is a balancing act – staying true to how you work, but also being adaptable. Some aspects of the SEEK environment made starting out easy. There are terrific people – kind, committed, funny, capable people across the organisation – often willing to help in any way. This makes it a fun place to work, and getting information is easy. There is also a strong community of product managers and lots of opportunities to share what’s working and not working, which has helped me to refine my approach – to prioritisation, team processes etc. And there’s a strong commitment to the ‘scientific method,’ where experimentation is widely encouraged and not just when experiments are winning, so I didn’t need to take the team on this journey! There were other aspects of the SEEK environment that I found challenging. SEEK is not a huge organisation, but it can be complex given that there are a lot of stakeholders and dependencies. Having worked in smaller organisations and start-ups recently I had forgotten the time and effort required to negotiate the extra complexity and to work out how to get things moving when multiple teams are involved. This makes for more time in meetings than I was used to, and in preparation of materials for internal use – time that in a smaller organisation could be used to solve your customer’s problems! I still say ‘no’ to a lot of meetings, but accept that collaboration is essential to getting great outcomes, and do the face time. Another challenge has been trying to overcome a resistance in the team to ‘think bigger.’ A market leader like SEEK has performed extremely well over a long period of time from a dominant market position. Modern software enables cheap, fast, lower risk experimentation but before these existed – there was a lot to lose. I think there is still a tendency in the culture to improve products incrementally (to not break what it not broken) when more of a step change is required. The team and I are challenging ourselves to consider bolder product initiatives, but which are scaled down into smaller increments of work that can be validated before investing too heavily and at too great a risk. I believe that trying your product management skills on a new product and in a new environment is a worthwhile experience. Here are some of the things that I do to get moving in a new gig. It’s so obvious but spending time with the team should be any PM’s first move. I normally meet with the tech lead, development team, delivery manager (if there is one) and designer(s) first. If there is a customer service team I will learn as much as I can from them and listen to some of their calls. I spend big chunks of time immersed in the product – going through every feature and clicking on every button. Who are the key players in my team and what are their goals? How well do I understand the product’s features and main customer journey(s)? After getting to know the team I immerse myself in the customer’s world. I look through any customer research, analytics/system data, surveys, live chat data, call centre reports etc. Whether this information is available or not – nothing beats speaking to customers. I will usually try to call 5-10 customers per week initially. ‘Non-customers’ – the ones that registered but did not buy/use the product can be a source of pure gold too. What are the top 5 customer(s) goals/jobs to be done/pain points? How can I programme customer conversations into my weekly schedule? Every team approaches product discovery and development differently. There is considerable variation in how problems are framed, how work is broken down, how meetings are conducted etc. I get clear on what the team rituals are very quickly, understand what my role is and make sure I do my bit from the start. I try to build trust with a new team by giving the existing processes a go before trying to modify them into what has worked previously for me. Do I understand the team’s process, it’s rituals and my role? Can I show solidarity to the team by helping with tasks beyond just my role as PM (such as help testing)? New environments can be challenging. It takes time to understand what is going on, how things work and what needs to be done. If you’re like me – you might question yourself (“Am I really any good?”). I try to accept that this will happen and that some self-doubt is OK. When self-doubt creeps in, I get very clear on what I think product management is and why it’s an important perspective. I also reflect on what I think my strengths are and recall wins that I have had previously. When you value your craft and yourself the team will also. Am I being too hard on myself as I get up to speed? What do I know about my craft and my strengths, and do I value them enough? The best product managers that I have worked with take action. They think first, then they act with urgency and they treat new initiatives as experiments. Instead of aiming for perfection they aim for an 85% solution and they move forward knowing that progress will yield insights. Early on in a new gig I build confidence by drawing on the team for ideas and support, and by picking some smaller challenges and getting them sorted. You can learn more about the customer and size up the bigger problems in the background. What can you act on right away and what is the next step? What’s the cheapest, lightest way to test the team’s hypothesis? When starting in a new gig I make the active choice to enjoy the process. Whether it’s meeting someone interesting, or getting absorbed in an engaging problem, learning something new or just being in a new location – there’s plenty of positives to be grateful for. What went well today and why? How can I treat my job more like play and less like an opportunity to fail? Starting off in a new environment is not easy but you are up to it and have something very big to contribute. Bring your full self into your new gig and smash it! If you feel like there were some more tangible and specific strategies that helped you to get going in a new Product Management gig please reply in the comments below. Why not join Chris at the Leading the Product Conference this year: 19 October in Melbourne and 24 October in Sydney. You can share experiences and meet others in the SEEK Product Management team. 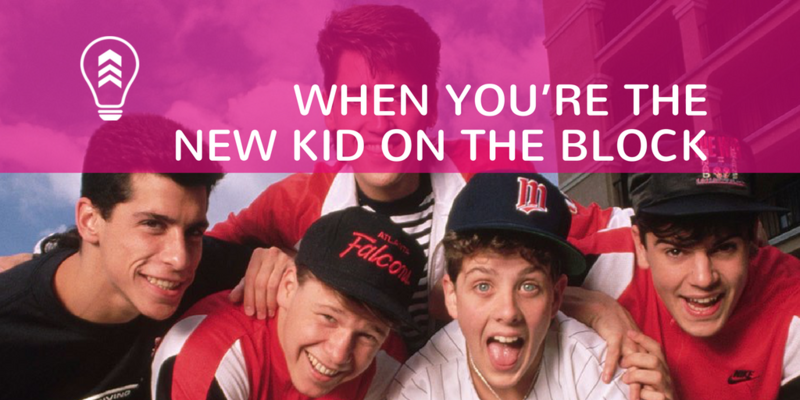 The “New Kids” for those that remember them. Courtesy, The Block/Boston Five at http://news.radio.com.